On March 27, 1964, the U.S. endured the most powerful earthquake in its history, Alaska’s so-called Good Friday earthquake, which was measured at a 9.2 magnitude. The 1964 Good Friday earthquake, the worst in North American history, caused a catastrophic series of tsunamis in the North Pacific. 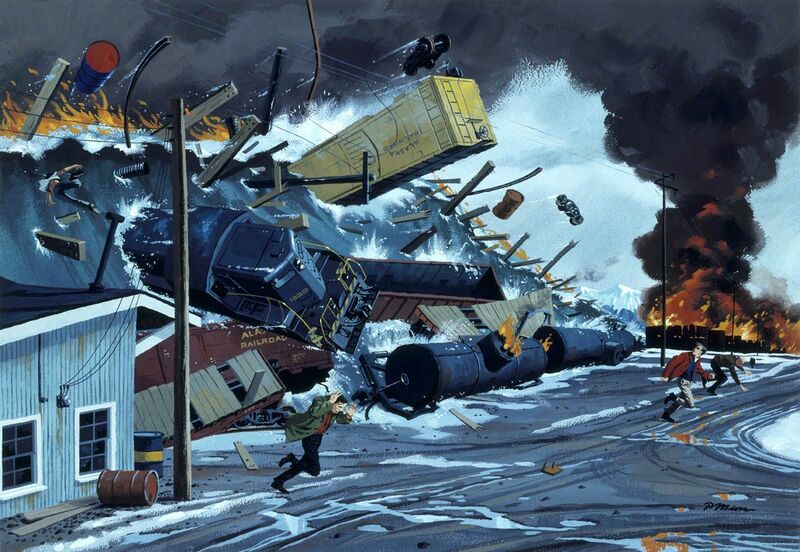 In this illustration, a tsunami's wall of water—topped by flaming oil—destroys the docks of Seward, Alaska. On March 27, 1964, a 9.2-magnitude earthquake struck south-central Alaska. The quake fell on Good Friday (the Friday before Easter Sunday), and was named after the religious holiday. The Good Friday earthquake was a megathrust quake. Megathrust earthquakes occur in subduction zones, where one tectonic plate violently slides beneath another. Off the coast of Alaska, the Pacific plate jolted beneath the North American plate. The Alaskan coast was largely unprepared for the Good Friday earthquake. Houses, schools, and other buildings collapsed. Water and sewage pipelines were destroyed. Landslides wrecked electrical and gas lines. The quake resulted in several tsunamis, which caused damage as far away as California, Hawaii, and even Japan. More than 125 people died. harm that reduces usefulness or value. to ruin or make useless. to roughly and suddenly shake something. earthquake that occurs in subduction zones (convergent boundaries), where one tectonic plate slides beneath another. series of pipes used to transport liquids or gases over long distances. liquid and solid waste material from homes and businesses.